A beautiful sunken pool connected to the ocean by underwater passages. 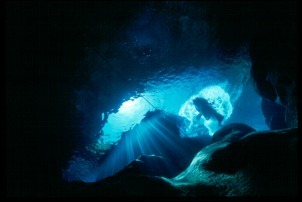 The sunlight shining on the ocean outside the cave gives the water it's amazing deep blue color. Grotto is one of Saipan's best diving spots.